Michael McFadyen's Scuba Diving - Consolidated PBY Catalina In 1933 the US Navy put out a specification for a new long-range patrol flying boat. The Consolidated P2Y and Martin P3M flying boats were the main aircraft in this category then and Consolidated Aircraft Corporation decided to start with the P2Y to create a new plane to tender. The designer of the P2Y, Isaac M. "Mac" Laddon, modified the design by raising the wing, changing the tail and some other modifications including new engines. The proposed plane was called the Model 28 and the prototype, XP3Y-1 was first flown on 28 March 1935. The plane was handed over to the Navy for service trials and returned in October 1935. Although still under testing, on 29 June 1935, the US Navy placed an order for 60 aircraft, unprecedented in those times, with Consolidated. The plane was a pure flying boat, with no amphibian capability. Despite this, the floats at the end of each wing were retractable. Once the plane was underway, the floats retracted outwards and the float itself formed the actual wingtip (the bottom becoming the outside edge of the wing). Coinciding with the production of this new aircraft, Consolidated Aircraft Corporation moved its headquarters from Buffalo to San Diego, California, with plants at San Diego and later Vultee Field California as well as Nashville, Tennessee, Wayne, Michigan, New Orleans, Louisiana, Miami, Florida and Allentown, Pennsylvania. The Navy asked for some modifications, including better engines (already specified for the 60 on order) and new tail surfaces. The modified plane, now called XPBY-1 first flew on 19 May 1936 and after testing was delivered to the Navy during October 1936, the same month the first of the 60 planes, now called PBY-1, were delivered to US Navy Squadron VP-11F. A second order for PBY-2 was placed on 25 July 1936, PBY-3 on 27 November 1936 and PBY-4 on 18 December 1937. 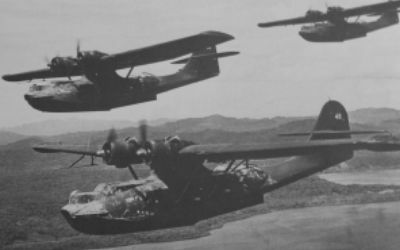 The first of the PBY-4s was returned to Consolidated for the installation of retractable wheels to make the planes amphibious. The main wheels came up into the side of the hull and the nose wheel retracted into the bottom of the nose. This plane was completed in November 1939 and redesignated as XPBY-5A. The uncompleted planes in an order for PBY-5s (33 of them) were delivered with this modification and called PBY-5A. An order for another 134 PBY-5s was placed on 25 November 1940 and they were delivered in late 1941. Around the same time, the Naval Aircraft Factory built 156 aircraft as the PBN-1. They had modified hulls and the nose wheel replaced by a tail-wheel. Consolidated PBYs were in service with not only the US Navy, by late 1939, the Soviet Union started producing their own version, the GST as well almost 200 US built planes. In July 1939, Model 28-5 was sent to the UK for evaluation. An order for 50 followed the start of the European war. These were called Catalina I. Like most US warplanes, the common name was that given to the planes by the British, although it is also stated that the name came from someone at Consolidated (eg the P-51 Mustang was named by the British). The Catalina I was similar to the PBY-5 but with different armaments. Delivery began in early 1941. A total of about 700 were eventually delivered to Britain, all but 11 were pure flying boats. Some were built by Boeing of Canada and other versions for other countries built by Canadian Vickers Limited as well as the Soviet Union as mentioned above. France, Australia, the Netherlands and Canada also ordered Catalinas (as these planes would become more commonly known). All up, about 4,000 planes were built (records are not accurate due to Soviet Union's poor records). Of these, only about 1,400 were amphibians. A total of 168 Catalinas ended up in service with the RAAF. 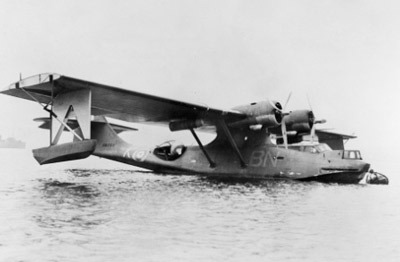 In June 1940, the Australian Government placed an order for seven Consolidated PBY-5 Catalinas and in September another order was placed for more. The aircraft were constructed for the Royal Australian Air Force (RAAF) at the San Diego plant. Two of these planes were allocated Australian serial numbers A24-3 and A24-6. The model of these aircraft was officially Model 28-5MA, similar to the British Catalina IVA which are equal to the US PBY-5. These are non-amphibious planes. The Catalina IVA was 19.5 metres long with a wingspan of 31.7 metres. The plane weighed 9,485 kg empty and had a maximum take-off weight of 16,066 kg. Power came from two 1,200 hp Pratt and Whitney R-1830-92 Twin Wasp 14 cylinder twin row radial engines with supercharger. This gave the plane a maximum speed of 282 kph and a cruising speed of 182 kph. Range with full military load was 3,782 km. Armaments were normally one 0.5 inch machine gun in each waist blister (between wing and tail), one or two 0.303 inch machine guns in the bow turret and one 0.303 inch machine gun in rear ventral hatch and up to four 454 kg bombs, mines or other items stored under the wings. In December 1941 the merger of Consolidated Aircraft Corporation with Vultee Aircraft Incorporation started, although this was not to be finalised until March 1943. The new company was called the Consolidated Vultee Aircraft Corporation. A24-3 left San Diego on 27 February 1941 under civilian registration VH-AFD (standing for Air Force D?) and was flown by Qantas to Sydney. 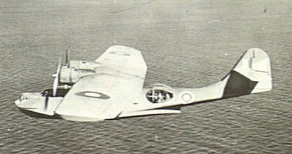 It was handed over to the RAAF at Rose Bay Flying Boat Base on 4 April 1941. I do not know what it did in the five weeks in between. On 29 May 1941, it was allocated to 11 Squadron, then on 14 August 1941 to 20 Squadron and then allocated to the Rathmines Flying Boat Base on Lake Macquarie, just north of Sydney, on 24 December 1941. It was used for sea plane training by the Seaplane Training Flight on 8 January 1942. It returned to 11 Squadron on 19 January 1942 and presumably moved to Port Moresby, in then Papua, soon after. A24-6 left San Diego on an unknown date under civilian registration VH-AFG (standing for Air Force G?) and was flown by Qantas to Sydney. It was handed over to the RAAF at Rose Bay Flying Boat Base on 5 July 1941. On 11 August 1941, it was received by 11 Squadron, then on 14 August 1941 it was allocated to 20 Squadron and then used for sea plane training by the Seaplane Training Flight from 6 September 1941, presumably at the Rathmines Flying Boat Base on Lake Macquarie, just north of Sydney. It returned to 11 Squadron on 15 January 1942 and presumably moved to Port Moresby, in then Papua, soon after. The 11 Squadron of the RAAF had moved to Port Moresby in September 1939 to carry out survey work for suitable landing sites in Papua and New Guinea. It had two C Class Flying Boats and two Seagull Mk5 amphibians. The new Catalina aircraft moved to the Territory of Papua (now part of Papua New Guinea) and were based in Port Moresby from probably late January 1942. This is only just over six weeks after the start of the Pacific War. On February 1942, the Catalinas from 11 Squadron made night raids on Rabaul, Territory of New Guinea. Here they encountered Japanese aircraft for the first time. During the attack, A24-3's radio operator was wounded in both ankles and the plane had to escape by diving into the smoke from the volcano on Matupit Island. On 10 February 1942, A24-6 was lead aircraft when an attack was made on Japanese shipping and landing forces at Gasmata on the south coast of New Britain, New Guinea (this is the other side of the island from Kimbe, where Walindi Resort is now located). Both planes may also have been on a raid on 27 February 1942 when Rabaul was again attacked. 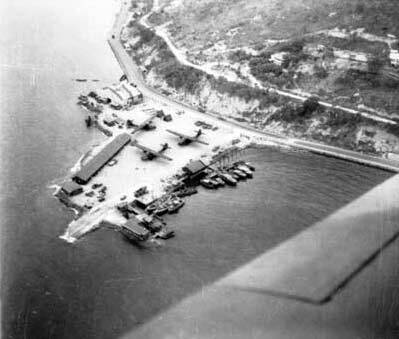 On 28 February 1942, four aircraft of the 11 Squadron were at the Napa Napa slipway (this is now the main wharf for the Napa Napa Oil Refinery). Three planes were moored south of the slipway and the other (A24-2) was on the slipway. On this day, at least 11 bombers and five Mitsubishi A6M Zero-Sen Zeke fighters made the fourth Japanese Air Raid on Port Moresby. 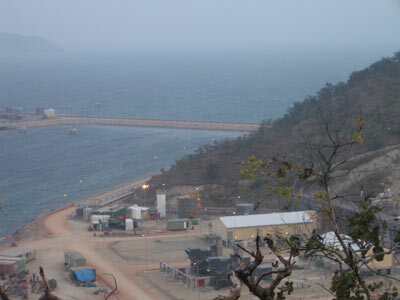 The Zeros attacked the Catalinas, coming in from the south right up Port Moresby Harbour towards Fairfax Harbour (some references state that the planes were in Fairfax Harbour but this is an incorrect interpretation of the town's waterways). The planes did Himmelman turns near Tatana Island and came back again. This may have occurred a few times. A24-3 and A24-6 suffered grave damage during these attacks and caught fire. The other planes were not damaged (although one source I have referenced says three were destroyed and one damaged). Crew and maintenance staff leapt into the water. Leading Aircraftman Pop Woods was in the crash rescue boat, pulling a man into the boat when the man was shot in the stomach by one of the strafing Zeros. They were thrown into the water and Woods towed the man to shore. One maintenance man is said to have died (perhaps the man shot in the stomach) and another injured. Both planes were on fire and they drifted north where both sank. One ended up in the location where the oil refinery wharf's retaining wall now stands (it appears to have been built over the plane) and the other ended up sinking a little to the north on the edge of a reef. One of the Zeros was said to have been shot down. The pilot survived and was taken to Cowra in New South Wales, Australia. He was killed in the massive Japanese breakout from the prison camp. It is said that after this attack, Port Moresby was left with only two Catalinas and one Hudson aircraft (this is the same source that says three were destroyed). Over the years since 1942, many people have attempted to find the planes without success. It is possible that some salvage work was done during the war (see later for an explanation). Without access to things like magnetometers and not knowing exactly where the planes had been moored, different methods were required. Mark Palmer, then a member of the Port Moresby Sub Aqua Club found a photograph in Neil Whiting's book, Wrecks and Reefs of Port Moresby - PNG that showed the Catalinas at their moorings. Guessing that the photo had been taken from the (now) residence of the Governor-General, in 1999 Mark talked his way onto the grounds and was able to confirm the exact location of the moored aircraft by comparing the photograph with the present-day shoreline. The Club dived at the location and found one of the mooring lines but a search showed no sign of either plane. They deduced that the planes had drifted further than thought. Since the prevailing wind in the harbour is a southerly, it was likely that they had drifted north. The search was complicated by the fact that the oil refinery was at that time being built just to the north. This meant they had to search this area with some undercover diving as the wharf was being constructed right where it was possible that the planes may lay. In fact, a little later this was confirmed when one plane was discovered almost totally buried under the wharf's retaining wall. It is now lost forever, totally covered by rubble and concrete. I have also been told that this plane was discovered during the construction of the wharf and the RAAF came and blew it up as it still had live ammunition on it. I find this a little hard to believe as I doubt that the RAAF would blow up such a historic item as a 60 year old plane. In late 2002, information came to the Club that Oro, a young man from the island of Tatana, had sighted what he thought was a wing of an aircraft while spearfishing. Oro had passed this onto David Dudai from Koki who regularly goes out with the dive Club. In early December 2002, the Club began searching the area to the north-west of the Napa Napa wharf. Finally, on 14 December 2002 after being lost for more than 60 years, the plane that sank on the edge of the reef was discovered by the Port Moresby Sub Aqua Club led by then President Mark Palmer. However, to date, the exact identity of this plane has yet to be discovered. It appears that someone had dived on this plane before this time as the bombs, a machine-gun and other items were missing. I believe that the machine gun was salvaged by people associated with the oil refinery and now sits under the desk of a senior manager in the oil refinery office. 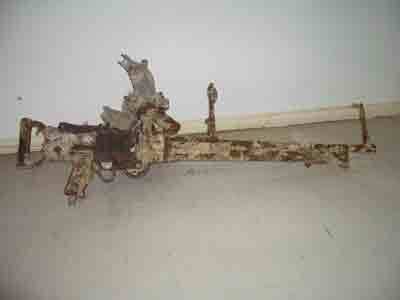 See the photograph below of the gun. This is a .303 inch machine gun from either the nose turret or the ventral hatch. Nowadays this plane sits on a sandy bottom about 100 metres north-west of the northern end of the oil refinery wharf. 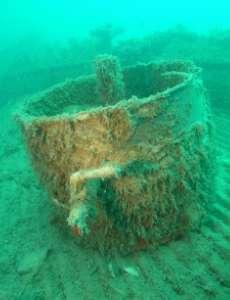 There was a buoy on the wreck, located on the starboard wing tip. The reef here runs north-south and the plane lies facing south. 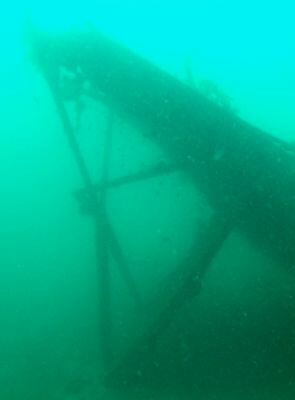 We anchored just off the wreck (the buoy was on a light line) and swim over on the surface. As this is a fair way up the harbour, the visibility here is often limited to a few metres. Note that I understand that the oil refinery management will now not let you dive here at all, ridiculous!! and the float is at the bottom of the struts Is this the Elsan toilet? After descending, you will see that the starboard wing tip is resting on the top of the reef in about 11 to 12 metres. The retractable float is down and this is what has caused that major break up of the plane. This float has landed on the reef top and the port float has landed on the sand, over four metres deeper, thus suspending the fuselage in mid-water. Unable to handle the weight of the plane, the wings have broken and the fuselage dropped to the sand. At this time, or perhaps before, the fuselage has broken just behind the wing. The tail section, comprising all the fuselage rear of the wing except for the hull and floor back to the end of the planing hull, has flipped over and is now facing the north. The tail section is about 135° to its normal vertical orientation, that is, the top of the tail is lying on the sand, this section tipped over to the side. 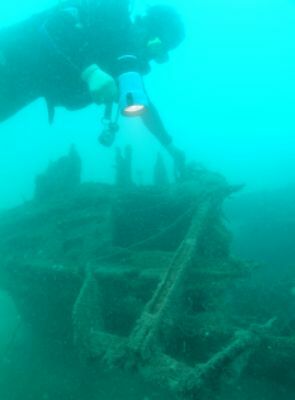 Starting from the starboard wing tip where you have arrived on the wreck, follow the wing towards the fuselage. The first major thing you will see, apart from the broken wing, is the starboard engine. This lies tilted forward and the propeller hub is in the sand, with one blade visible. Next is the fuselage. This is a very wide aircraft, the cockpit bigger than any World War II aircraft I have ever seen. Even much larger such as Boeing B-17 Flying Fortress and the Short Sandringham S25 do not have as much room as the Catalina, they all have very cramped cockpits. You can see the pilots' seats, the rudder pedals, the throttles etc. Looking back into the cabin you can see what is almost certainly the radio set. Forward of the cockpit is the front gunner/bomb aimer's position. This consists of a small compartment, with a machine gun and a window for aiming. On the port side of this position you will see the aircraft's anchor, attached to the fuselage. The port engine is right next to this, broken completely off the wing and now lying propeller down on the sand. The wing is broken again just past here, as the port float lies on the sand, pushing the wingtip far higher than the rest of the wing. The float and support struts are more recognisable on this wing and give a good indication of what the plane looked like when operational. As you swim back along the trailing edge of the wing you will notice that the ailerons and flaps are totally missing. The broken rear fuselage soon comes into view, the floor of the plane clearly visible. The only item of interest is what at first appears to be an urn, but which I believe is an Elsan toilet. Perhaps any more knowledgeable reader can advise me after looking at the attached photograph. You can see the tail section from here and also the ailerons and flaps which lie on the eastern side of the plane now. The bottom of the plane's tail clearly shows the ventral tunnel gun hatch, a rectangle hole in the hull. On my dive here I did not notice the beam gun openings, I suspect that the plane broke at this section. I did, however, notice the frames for the cupola windows lying on the sand, but I cannot remember exactly where they were now. 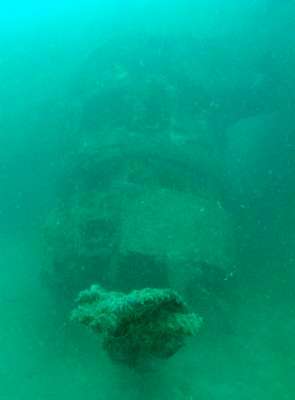 In summary, this is a fascinating wreck, one of only two Australian World War II aircraft that I know that can be dived anywhere in the World (the other is also a Catalina, in Kavieng, PNG). I only know of one other Australian warplane that can be dived and that is the Fairey Firefly in Jervis Bay, south of Sydney. 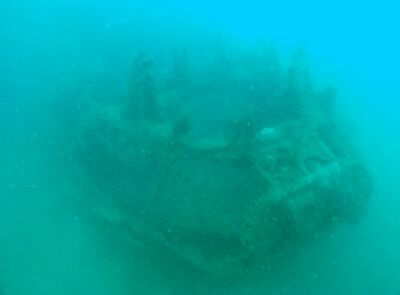 The dive operation in Port Moresby does not dive this wreck as they have their boat based south at Bootless Bay. The only way you can dive the plane is with the Port Moresby Sub Aqua Club (contact President Mark Palmer) who would be more than happy to take you out diving if you are visiting Port Moresby. Phone conversation and email from Michael (name withheld to protect).